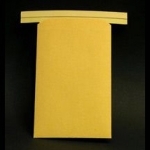 Description: Coin envelope, 3 x 5 ". Envelope has soft metal, fold over, locking tabs, 32 lb Kraft paper is resistant to breakage by small rock samples. Positive seal at all glued surfaces. Holds approx 6 oz.